We know you mostly love Christmas and all the trappings, but we also know there are some events that occur during the holiday that can kill your buzz. Snooty relatives who look down on you. Parties that are too ostentatious. Dinners you feel like you should eat because they’re obviously expensive and you won’t get this kind of opportunity for fine dining but the food still looks horrid. And yeah, just like Thanksgiving, someone’s gonna bring up politics! So if you need a break from the formalities, or a bulwark for that function you have to go to later on, come bring your family, friends and even some random strangers to the New Beverly on Christmas Day afternoon, and enjoy two classic comedies featuring Hollywood’s greatest Social Jesting Warriors! 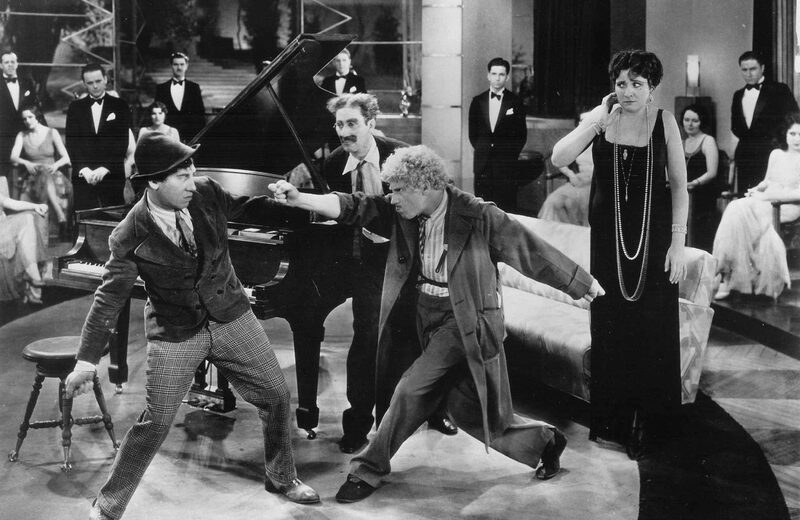 We’ve put the four Marx Brothers in Animal Crackers together with W.C. Fields in You Can’t Cheat an Honest Man for a combined assault against polite pretentiousness so funny eggnog will shoot out of your nose! 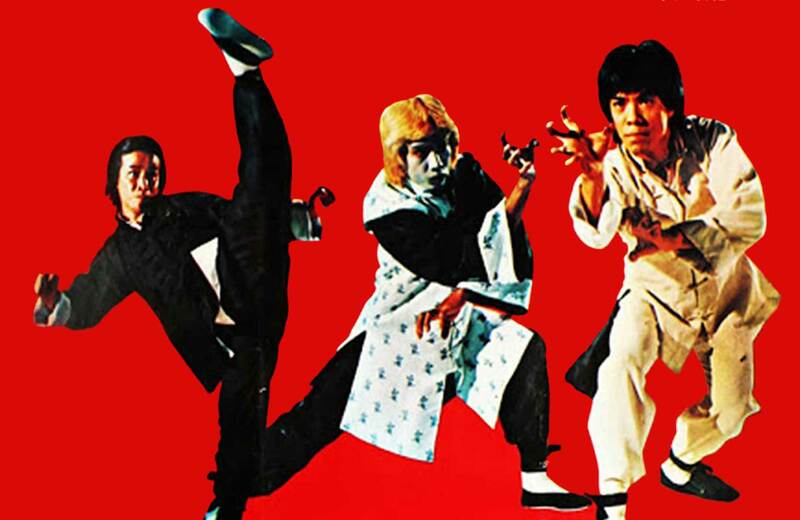 The modern comedy fan that embraces the extremes the art form has ventured to may initially believe there’s a large gulf between what they love now and what was popular over 75 years ago. The truth is there’s a direct kinship that continues to make these pioneers’ work relevant today. Do you enjoy the Dadaist challenges to the tropes of comedy itself that Tim & Eric do well? Harpo and Groucho were playing those cards out of the starting gate. (After all, everyone treated that greasepaint mustache as perfectly normal.) What is Doug Benson’s public love of the wacky weed, or the late Bernie Mac’s admonition of children as terrorists, but reworkings of Fields’ persona of the aggrieved iconoclast wishing to be left alone to enjoy a favorite diversion? Maybe they would initially blanch at the graphic extent of certain jokes, but if they could visit with us today, the Marxes would have guffawed at Sausage Party, and Bill Fields would have sent Bob DeNiro some congratulatory “pineapple juice” after seeing Dirty Grandpa. There are unique spiritual links between the movies in our combo. Of particular note is their mutual depiction of ballsy hustlers upending the comfort of the 1%. Groucho’s presence at the Rittenhouse mansion in Crackers is definitely a visit to a club that would not have him as a member. Bill’s visit to his daughter’s fiancee’s rich family in Cheat, wearing a cape shamelessly promoting his flagging circus, results in the matriarch driven to conniptions as he blithely speaks of her greatest phobia, snakes. Bill and the Marxes all came from hardscrabble backgrounds, encountering ethnic and class prejudice on their path to success, and they funneled that experience into getting in a few licks at the upper crust. There are also coded references to real-life Hollywood bacchanalia: The playwrights behind Crackers very likely drew the name “Captain Spaulding” from the alias of a notorious dealer-to-the-stars at Paramount, and Fields hid behind the name of a bootlegger friend, Charles Bogle, for his story credit on Cheat. Praise must be doled out for the solid supporting players these rapier wits joust with onscreen. In Crackers, Margaret Dumont makes the second of seven film appearances with the Marxes, embodying the privileged society paragon either oblivious to or secretly aroused by being zinged. Dumont already had a respected background in comedy and musical theatre before being a Marx company member, and once said her skill was to elevate her acting partner without upstaging, and to provide a verbal buffer between punch lines so that none would be missed by an audience laughing at the previous joke. She would provide this gift for other comedians all her life, including Fields. Fields meanwhile in Cheat has a knotty antagonist in Charlie McCarthy, and his more polite ventriloquist Edgar Bergen. 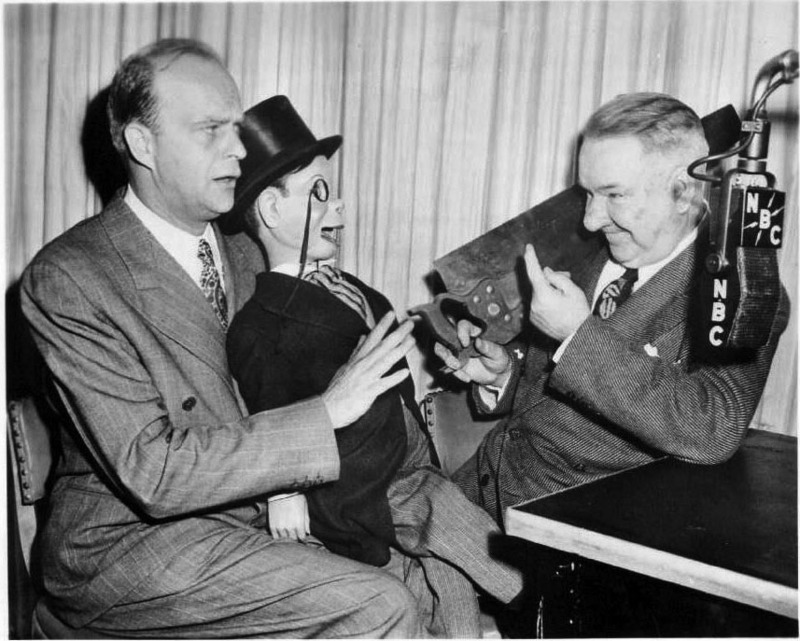 Bergen and his dummies McCarthy and Mortimer Snerd had become stars on The Chase and Sanborn Hour radio show in 1937, and Fields, then recovering from on-set injuries made worse by his alcoholism, was invited to join them. Though these programs were supposed to have a script on file with sponsors, Fields frequently threw out his lines and used his own, and Bergen was able to adapt and ad-lib accordingly, building their chemistry and mutual respect. When his contract was dropped by Paramount, his radio popularity led to a new contract with Universal, and his first instinct was to put Bergen and McCarthy in Cheat to add a visual component to their war of insults. 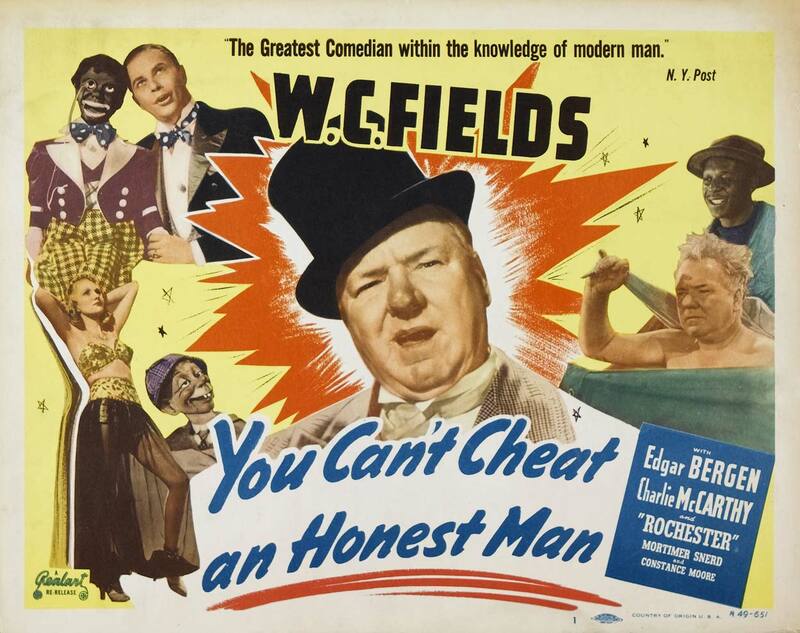 In one last fanciful happenstance, this screening date will mark the 70th anniversary of the day that W.C. Fields left our plane of existence, hoping for eternal rest in Philadelphia, but having to settle for Glendale. It may sound sad to pass away on Christmas, but as legend has it Fields was not a fan of the holiday, so if that’s the case, he finally got the present he always wanted: escape from participating in it! Join us for an afternoon of Christmas Day comedy at the New Beverly this December 25th! You can even come in your pajamas. (How you got into those pajamas we don’t wanna know.) Just bring your holiday spirits… but leave your blended spirits somewhere else to enjoy after the movie!